The Self-Help section of Psychology Tools is designed for anyone who wants to understand more about cognitive behavioral therapy (CBT) and use it to make a difference in their lives. Cognitive behavioral therapy (CBT) is an extremely popular and effective form of psychological therapy that is practised by many thousands of therapists worldwide. CBT theory suggests that our thoughts, emotions, body sensations, and behavior are all connected, and that what we think and do affects the way we feel. Thousands of research trials have demonstrated that CBT is an effective treatment for conditions from anxiety and depression to pain and insomnia. It is effective across the lifespan – children, adolescents, adults, and older adults can all benefit – and is helpful in both face-to-face and self-help formats. Where did CBT come from? Cognitive behavioral therapy (CBT) is an extremely popular form of psychological therapy that is practised by many thousands of therapists worldwide. In fact, CBT isn’t one thing. It has developed in tandem with new scientific discoveries. ‘Behavior therapy’ was a popular approach to psychological problems in the earlier part of the twentieth century. In the 1960’s the role of thoughts (the ‘cognitive’ part of CBT) became a focus and led to the development of new therapeutic techniques. CBT was the integration of behavioral and cognitive therapies and has, over time, adapted to encompass newer approaches. It is better to think about CBT as a ‘family’ of therapies that adapts as scientists make new discoveries about how people ‘work’. Recent developments that CBT has embraced include mindfulness, acceptance, and compassionate approaches (sometimes called ‘third wave CBT’). Fundamentally, all of these are compatible with the cognitive-behavioral way of understanding people and their problems. Figure 1.1: The evolution of modern cognitive behavioural therapy (CBT). Therapists who practise psychological therapies are trained to focus on particular aspects of a person’s experience, and to react in particular ways. We can say that every therapy has a different ‘stance’. CBT’s stance is here-and-now, rational, and collaborative. CBT theory says that the here-and-now is where a person’s pain and suffering lies: if we are anxious we feel the fear now, and if we are depressed our feelings of sadness or loss are happening now. CBT also recognises that we might be doing things in the here and now that inadvertently prevent the problem from lifting – if this is the case then an obvious solution is to discover and address these as soon as possible. Sometimes CBT is criticized for this here-and-now stance by people who argue that it ignores a person’s past. This is a misunderstanding though. CBT pays close attention to our personal histories since understanding the origin of problems and beliefs is often essential to making sense of them. That said, the problems are causing pain and suffering in the present – and this is where we have the power to make changes – and so the focus of CBT will typically return to the present moment. Another part of the CBT stance is that it is ‘rational’. CBT takes the position that human experiences are understandable, and that our feelings are a result of processes that we can make sense of. When working together, a client and CBT therapist will come to a shared understanding of a problem and, building on that understanding, think of ways to address the problem. CBT also promotes a rational approach to thinking. The goal is not to ‘think happy thoughts’ but for our thinking to be balanced, accurate, and rational. Finally, CBT therapists will make a point of conducting therapy that is collaborative. CBT therapists aim for therapy to feel like a journey of exploration where the therapist is ‘beside’ the client instead of one where the therapist is positioned as an expert. One goal of CBT therapy is for the you to become your own therapist – you are the expert on your own life – and CBT aims to equip you with a toolkit to assist you. Practitioners of CBT place a strong emphasis on evidence. CBT is an evidence-based form of therapy, which means that researchers try to discover what components of therapy work, for which problems, and why. Individual therapy also pays close attention to evidence: clients in CBT are typically encouraged to set personal goals (e.g. “If I was feeling less anxious I would be able to do my shopping by myself without needing to escape”) and then record data (evidence) about whether these goals are being met. This helps to ensure that therapy stays focused on the needs of the person seeking help. When we ask “How effective is CBT?” we really mean: “What is it effective for?” and “effective compared to what?” We also need to consider “how often do these conditions get better by themselves?” One way that researchers address these questions is by conducting randomised controlled trials (RCTs), where different treatments are carefully and systematically compared to one another. The same process is used in medicine to test the safety and effectiveness of new drugs. 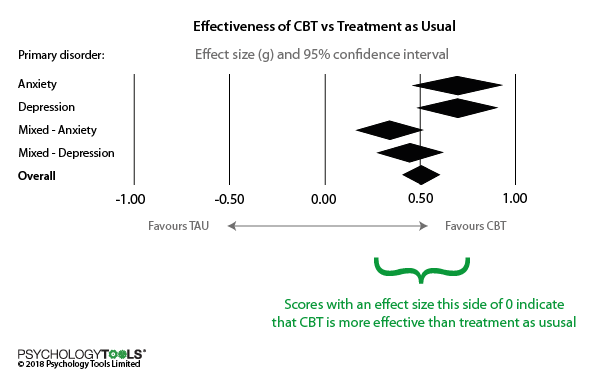 Over the past few decades thousands of such studies have examined CBT, and researchers can now combine the results of these RCTs into ‘meta-analyses’ to show, in even more reliable ways, which treatments work. The graph below shows the result of a meta-analysis of CBT that was published in 2015. The results are from 48 studies that compared CBT with ‘treatment as usual’ for nearly 7000 people with anxiety, depression, or mixed anxiety & depression. The results show a clear effect in favour of CBT – more people get better when they receive CBT compared with their usual treatment. Another way to measure how effective CBT is for treating psychological problems is to look at ‘response rates’. Somebody is said to ‘respond’ to a therapy if their symptoms have improved significantly by the end of treatment. A study that compared 106 meta-analyses was published in 2012. 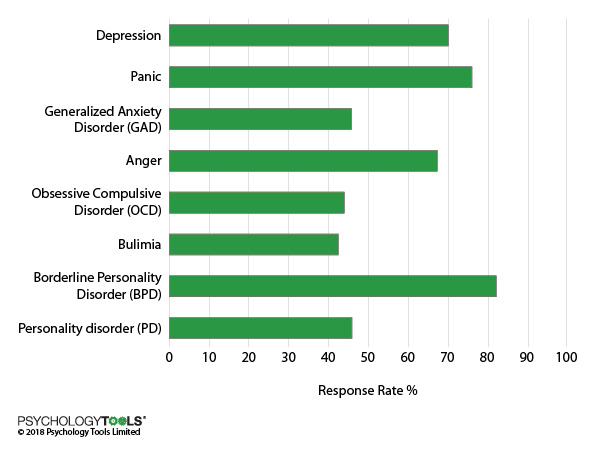 The graph below shows the response rates for CBT across a wide variety of conditions. These results look good, but you might be thinking “What do the results look like for the alternatives?” Where adequate data were available, that same study also compared the response rates of CBT to other ‘genuine’ forms of therapy or treatment as usual. CBT for depression was at least as effective as medication or other forms of psychotherapy, and more effective than treatment as usual. 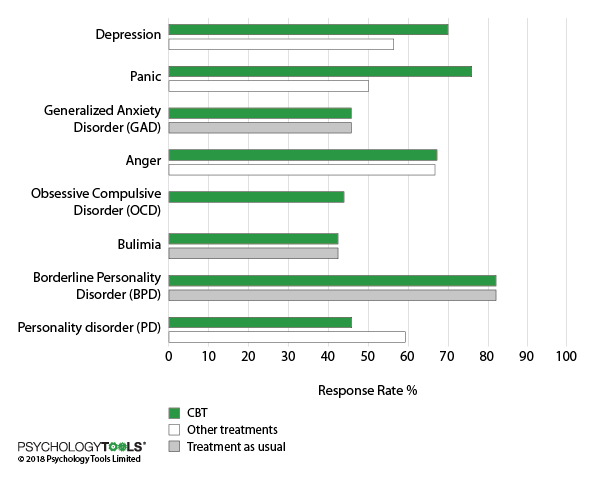 CBT for anxiety was typically superior to other forms of genuine and placebo therapies, and was judged to be a “reliable first-line approach for treatment of this class of disorders”. The message of these reviews is that for many conditions CBT is as effective or more effective than other genuine forms of therapy, and is typically better than ‘treatment as usual’ (which often includes medication or check-ups with doctors) or doing nothing. In recognition of its effectiveness there has been a nationwide push by government in the United Kingdom to make CBT therapies available for free to everyone who needs them. What do professional organisations say about CBT? Other people have summarised the evidence too. Here is what a number of professional organisations have to say. 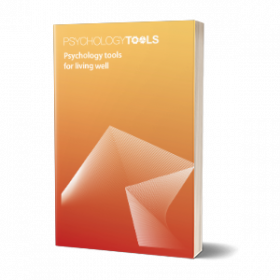 If CBT sounds interesting to you then the next step is to carry on working through the Psychology Tools Self-Help section. If you read each chapter and practise the exercises you will learn how to make CBT a useful part of your life. The next chapter is A Guide To Emotions. Watts, S. E., Turnell, A., Kladnitski, N., Newby, J. M., & Andrews, G. (2015). Treatment-as-usual (TAU) is anything but usual: A meta-analysis of CBT versus TAU for anxiety and depression. Journal of Affective Disorders, 175, 152-167. Hoffman, S. G., Asnaani, A., Vonk, I. J. J., Sawyer, A. T., & Fang, A. (2012). The efficacy of cognitive behavioural therapy: a review of meta-analyses. Cognitive Therapy Research, 36, 427-440.